This is the official user guide and announcement page for GWX Control Panel, the easiest way for users of Windows 7 and Windows 8.1 to protect their computers from Windows 10. 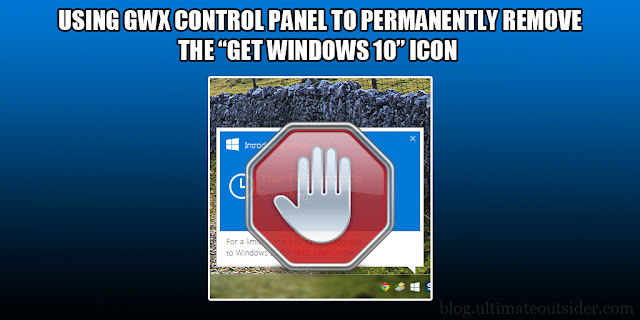 With GWX Control Panel you can: Remove the "Get Windows 10" icon that appears in your notification area, prevent your Windows Update control panel from upgrading your computer to Windows 10, prevent your computer from secretly downloading Windows 10 installation files, detect and remove the hidden Windows 10 installation files if they're already on your PC, optionally monitor your computer for unwanted Windows 10-related settings and files- and beginning with version 1.7 you can now easily delete some hard-to-remove program files that are known to cause Windows 10 upgrades and annoyances. GWX Control Panel is free software that really works, is safe and easy to use, and gives you the option to re-enable the icon and upgrade notifications if you're ever ready to move forward with Windows 10. August 1, 2016: The current version of GWX Control Panel is still 1.7.4.1, and Microsoft has finally ended their year-long "Get Windows 10" campaign of pestering Windows 7/8.1 users into upgrading to an operating system that they don't necessarily need or want. While the jury's still out on whether Windows 7/8.1 folks are truly out of the woods, I have added a topic to the FAQ that discusses GWX Control Panel's role in the post-July-29th world (see topic #2). I've also written some new instructions for uninstalling/removing GWX Control Panel if you're the gambling type. Sometime soon- probably in the coming week- I will publish a minor update to the program that fixes a couple of bugs that are already described in the troubleshooting guide. I had been working on a HUGE feature for the next major version, but my non-GWX responsibilities prevented me from completing that work before Microsoft halted Phase One of the Windows 10 upgrade push. It will probably show up in another of my projects though- and maybe even a future version of GWX Control Panel if Microsoft ever releases the Win 10 kraken again. Please note that due to the increased demands of my day job, I am not able to respond to blog comments or emails very often, so forgive me if my responses are slow. If you're looking for help with the program please check out the links mentioned in the following "Tips." Thanks! Tip: Having problems with GWX Control Panel? Check the troubleshooting guide. Tip: Do you have questions not answered below or in the troubleshooting guide? Check the FAQ. Tip: You guys broke the Internet! This post has so many comments that my blog started putting them on a separate page! Look there if you posted a comment recently and are looking for a response. NOTE: GWX Control Panel has always been available as a stand-alone executable, but a convenient installer option is also available. The installer creates some handy icons and enables seamless upgrades, but doesn't include any additional software. The choice is yours. The Disable 'Get Windows 10' App feature removes Microsoft's "Get Windows 10" nagware app from your notification area. This is the 'Get Windows 10' icon app. The Prevent Windows 10 Upgrades feature checks for system settings that leave you vulnerable to unwanted Windows 10 upgrades and gives you the ability to fix them. This is one of numerous ways that Windows 10 can hijack your Windows Update control panel. 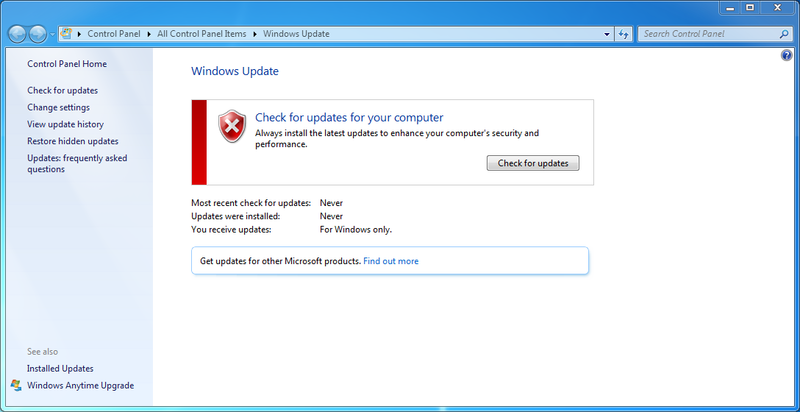 In this example, Windows Update is hiding the normal Windows 7 updates behind the "Show all available updates" link. The Prevent Windows 10 Upgrades feature can even rescue your PC from impending Windows 10 installs that display the "It's almost time for your upgrade" window. The Delete Windows 10 Download Folders feature locates and deletes hidden Windows 10 installer files that Microsoft secretly downloads to your computer. The Delete Windows 10 Programs feature easily deletes hard-to-remove program files that are known to prepare your computer for Windows 10 upgrades. The program can alert you if your Windows Update settings change from one of the safer "download only" or "check only" options to "automatically install" behind your back and gives you the chance to fix it with the Change Windows Update Settings feature. The optional Save Diagnostic Info feature (in the right-click pop-up menu of the title bar) generates enhanced diagnostic reports that give you detailed information on any settings GWX Control Panel finds that leave you open to unwanted Windows 10 behavior. The optional "Monitor Mode" feature runs quietly in the background watching for unexpected system changes, and alerts you as soon as any new Windows 10 settings or files are detected. Doesn't include any additional third-party software (you can even download it as a stand-alone executable). Doesn't collect any personal data or "phone home" in any way. Doesn't do any specific checking or disabling of Windows "telemetry" features, although this may appear as an optional capability in a future release. Doesn't (yet) prevent the Windows 10 advertisements that Microsoft displays in web browsers. At first I thought it was unique to Internet Explorer, but now it appears that the ads are tied to specific Microsoft sites (most notably MSN.com) rather than Internet Explorer itself. I am currently investigating whether there's a safe way to stop this. (But for now if you don't want to see those ads, just don't go to MSN.com or other Microsoft sites that display them.) There are examples of these specific in-browser ads at the troubleshooting guide. The installer gives you some handy Start menu and desktop shortcuts for GWX Control Panel, documentation, and the uninstaller. Using the installer allows for a more streamlined experience when updating to newer versions of GWX Control Panel, for a number of reasons. The standalone version is still available for folks who want it, though. 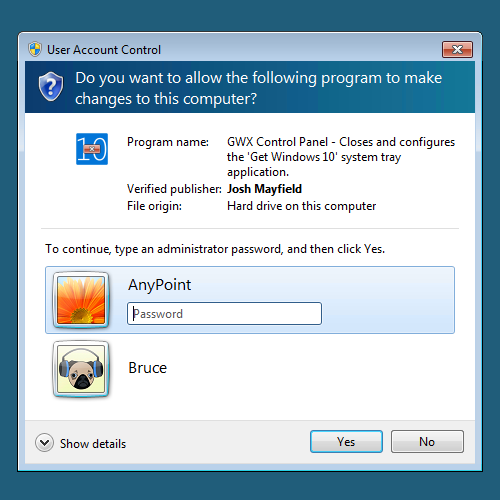 Use an administrator account when installing or uninstalling GWX Control Panel. (Standard and Child accounts actually run software installers using an administrator account's credentials, and this can result in a confusing experience for non-technical Windows users.) The troubleshooting guide has more information about how to use GWX Control Panel with Standard and Child user accounts. If your computer has multiple user profiles, log out of all profiles except your primary administrator user account before installing or uninstalling the program. The installer closes running instances of the program before upgrading or removing GWX Control Panel, but it cannot "see" instances of the process running under other user accounts. The fail-safe thing to handle this is to restart Windows, log in to an administrator account of your preference, then install, upgrade, or uninstall as desired. If you use the GWX Control Panel installer, then upgrading from one version to the next is very simple. Just follow the Important guidelines listed above and run the GwxControlPanelSetup program. The installer will safely upgrade everything for you. If you use the optional Monitor Mode, launch your existing GWX Control Panel version and click Disable Monitor Mode or use the Enable/Disable Monitor Mode for Current User option in the right-click pop-up menu of the title bar in order to disable monitor mode for your current version. Delete your old copy of GWX_control_panel.exe. Launch your new copy of GWX Control Panel and re-enable Monitor Mode with the new version if you plan to use that feature. HOW DO I BLOCK WINDOWS 10? The main GWX Control Panel window in version 1.7.1. Windows 10 upgrades are blocked and Get Windows 10 app isn't installed. Windows 10 upgrades are blocked and Get Windows 10 app is installed but disabled. Click the "Click to Disable 'Get Windows 10' App" button. Click the "Click to Prevent Windows 10 Upgrades" button. If you're a completist, click the "Click to Disable Non-critical Windows 10 Settings" button. You can optionally use the "Click to Enable Monitor Mode" button to have GWX Control Panel watch your system for any changes to your Windows 10 settings. I posted a quick video tutorial for GWX Control Panel 1.1 at YouTube. There's also another tutorial that covers the new features in versions 1.2 and 1.3. Many features have been added since those videos were produced, however. The upper portion of the main GWX Control Panel window is enclosed in a box labeled Information. This is where you can learn how protected your PC is from Windows 10 upgrades and notifications. Is 'Get Windows 10' icon app running? This indicates whether the Microsoft program that creates the "Get Windows 10" icon in your notification area is currently running. If the program doesn't exist on your computer, it will say, "(App not found)". Is 'Get Windows 10' icon app enabled? This indicates whether Microsoft's "Get Windows 10" is configured to run on your PC. It is possible for this field to say Yes, even if the first field says No, because Microsoft uses a series of scheduled tasks to determine when to run the program. If the program doesn't exist on your computer, it will say, "(App not found)". Are Windows 10 Upgrades allowed? This field indicates whether your computer is vulnerable to unwanted Windows 10 upgrades and related side-effects that can appear in your Windows Update control panel. If this field says Yes, it means that one or more critical system settings are set in such a way that you might experience unexpected Windows 10 upgrades or other upgrade-related behaviors in certain parts of the operating system (such as messages in the Windows Update control panel encouraging you to upgrade to Windows 10). If you would like to know exactly which settings GWX Control Panel discovered, you can find this information in the output file generated by the Save diagnostic info command in the program's system menu. (See "The System Menu" section for more info.) Click the Prevent Windows 10 Upgrades button to make this field go to "No." Non-critical Windows 10 settings enabled? (New in version 1.7.1) There are a number of other Windows 10-related settings that aren't necessarily harmful, but occasionally result in annoying behavior. This field reads Yes if any of those less-significant settings are detected. The Disable/Enable Non-critical Windows 10 Settings button manages these settings, and you can get details on which settings are enabled by looking at your Save Diagnostic Info report. Windows 10 Download folders found? Microsoft pushes the Windows 10 installer files into secret, hidden directories on unsuspecting users' computers through a couple of different methods. This field indicates whether GWX Control Panel detects one or more of the locations where these files are known to reside. Size of Windows 10 download folders: If one or more of the hidden download folders are found, this field indicates the total amount of storage space occupied by the files they contain. Open BT Folder: When the hidden $Windows.~BT download folder is found, you can click this button to open the folder in Windows File Explorer. Open WS Folder: When the hidden $Windows.~WS download folder is found, you can click this button to open the folder in Windows File Explorer. This folder is less common, and is usually the result of running Microsoft's Windows 10 Media Creation Tool. Automatically install Windows Updates? If this field says Yes, it means that you currently have Windows Update configured to automatically install new updates on a regular schedule. This is not recommended if you truly wish to avoid Windows 10, since Microsoft routinely pushes new Windows 10-related updates, and you could easily get an unpleasant surprise by installing all new updates without reviewing them first. This field is new in version 1.7, in response to a number of reports I've heard from Windows users who claimed their Windows Update preferences changed from "download only" or "check only" to "automatically install" without their consent. GWX Control Panel checks for this now so you can catch any unexpected changes. Status and settings summary. Most of the time, this little box gives you a quick summary of your PC's current status as far as Windows 10 files and settings go. This box can also display the current status of operations that take some time to complete. Click to Enable/Disable 'Get Windows 10' App: This enables or disables Microsoft's Get Windows 10 icon app, either removing or restoring the icon in your notification area, as desired. This button is only available if GWX Control Panel detects the app on your PC. Click to Prevent/Allow Windows 10 Upgrades: This changes a couple of settings that determine whether Microsoft is able to upgrade your PC to Windows 10 or change the behavior of your Windows Update control panel to deliver Windows 10 advertisements and updates. This does NOT disable Windows Update and does not block or hide any Windows Update patches. Click to Delete Windows 10 Download Folders: If any of the hidden Windows 10 installer folders are detected on your computer, you can use this button to delete those files and free up storage space. This button is not available if no download folders are detected. Note that this procedure can take some time (once it starts actually deleting files, you should see the "Size of Windows 10 download folders" field report gradually decreasing sizes. If you have trouble deleting all of the files, you can use the "Save diagnostic info" option in the program's system menu to see if there were any telling error messages. Click to Delete Windows 10 Programs: This removes files and background tasks known to cause Windows 10 upgrade symptoms. This button is only available if GWX Control Panel detects these problem files on your computer. See the GWX Control Panel FAQ if you use this feature but eventually decide you want to upgrade to Windows 10. Click to Change Windows Update Settings: This new button in version 1.7 opens a dialog box where you can change how Windows update behaves. These are some of the same options available in the "Change settings" screen of the Windows Update control panel. For the best balance of security and protection from Windows 10, it's recommended that you choose one of the options that lets you choose which updates you wish to install, rather than installing all updates automatically or disabling updates entirely. Click to Clear Windows Update Cache: While not directly related to Windows 10, this step is sometimes necessary to remove some lingering Windows 10 notifications from your Windows Update control panel after using the "Prevent Windows 10 Upgrades" feature. While this feature isn't harmful, it really isn't necessary in most cases, and it does result in some one-time changes in Windows Update that some users might find annoying. GWX Control Panel lists all known one-time effects when you choose this option and gives you a chance to decide whether to proceed before clearing your update cache. Click to Disable/Enable Non-critical Windows 10 Settings: This feature relates to settings detected in the "Non-critical Windows 10 settings enabled" information field. Clicking this button enables or disables those settings, as needed. These particular settings don't leave you vulnerable to unwanted upgrades, but they can cause some annoying behavior in some cases, so you might need to disable them if disabling the Disable Get Windows 10 App and the Prevent Windows 10 Upgrades features don't clear up all your problems. Note that Windows sometimes changes these settings in the background, so you might occasionally have to re-disable these settings if you want them to remain off. 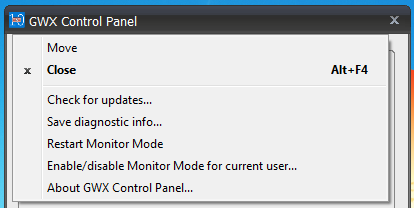 Click to Enable/Disable Monitor Mode: Use this button to manage the Monitor Mode feature of GWX Control Panel. Monitor Mode places an icon in your notification area that alerts you if it detects any changes to your PC that might leave you vulnerable to Windows 10. Please see the "Using Monitor Mode" section below for more info. Note: This button configures Monitor Mode for all user profiles on the PC. If you'd like to manage Monitor Mode for just a single user profile, you can use the Enable/disable Monitor Mode for current user command on the system menu. Click to Display the User Guide: This launches your default browser to the GWX Control Panel user guide. The version 1.7 system menu. Check for updates: This opens a dialog box that displays the version of GWX Control Panel you're currently running and links you to the Ultimate Outsider Downloads page to see if a newer version is available. Save diagnostic info: This saves a file called GwxControlPanelLog.txt to your desktop that contains relevant information about your computer and your Windows 10-related settings and files. Beginning with version 1.7 this report explains exactly what system settings it detected on your PC, which will help you understand what's going on behind the scenes when Monitor Mode detects new changes, for example. Restart Monitor Mode: You can use this to launch a Monitor Mode instance if you have Monitor Mode enabled, but it's not currently running. Enable/disable Monitor Mode for current user: Use this to manage monitor mode configuration for a specific user account on the computer. This replicates the behavior of the Enable/Disable Monitor Mode button from version 1.6 whereas in 1.7 that button now manages the feature for all user accounts on the computer. About GWX Control Panel: Just displays a dialog box with the current version and author information. 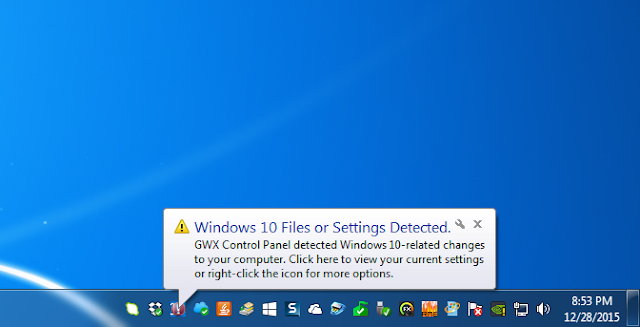 When you enable GWX Control Panel's optional Monitor Mode, a new icon will appear in your notification area that will alert you if GWX Control Panel detects any unexpected files or settings that leave you vulnerable to Windows 10. Once enabled, GWX Control Panel will start and quietly monitor your computer whenever you log in to Windows. If your computer has multiple user profiles- and especially if some of those profiles are Standard or Child accounts- the best way to use Monitor Mode is to enable it for all users. 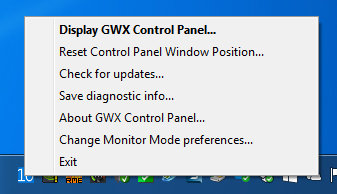 To do this, just click the Enable Monitor Mode button in the main GWX Control Panel window. The notification icon will appear in the currently logged-on session of Windows, and will also appear for other user accounts who later sign in to Windows. To disable Monitor Mode, just click the Disable Monitor Mode button. If you do this from a Standard or Child user account, you will have to enter the password of an administrator user account in order to proceed. Please see the troubleshooting guide for more information about the limitations of Standard and Child user accounts. If you'd prefer to only have the Monitor Mode icon active on a per-user basis, or if you'd like to disable the single-user Monitor Mode from a previous version of GWX Control Panel, just choose the Enable/disable Monitor Mode for current user option in the program's system menu (accessible by clicking the icon in the upper-left corner of the program window). The Monitor Mode balloon notification. Double-click the Monitor Mode icon in your notification area. Right-click the Monitor Mode icon and then click Display GWX Control Panel from the shortcut menu. Any of the above three actions also stops the notification icon from flashing. Once you have a visible instance of GWX Control Panel open, check the various fields in the program's Information section to see what files or settings may have triggered the alert. If you'd like a more detailed report, you can use the Save diagnostic info option from the shortcut menus of either the Monitor Mode icon or the main GWX Control Panel window. User A receives a Monitor Mode alert because some Windows 10 files were detected on the computer. The user dismisses the alert but decides not to do anything about it. User B logs in to Windows and also receives the alert, but likewise doesn't do anything to fix the problem. When user A logs back into Windows, Monitor Mode does not alert that user about the same problem again. Keep this in mind if you receive a Monitor Mode alert about something you don't care about. For example, if you are aware of the risks of leaving your Windows Update set to "Install updates automatically" and wish to leave it that way, just dismiss the Monitor Mode alert and forget about it. You won't be bothered again unless someone changes your Windows Update settings to something else and then changes it back to "install automatically." Display GWX Control Panel: Opens a visible instance of GWX Control Panel if one isn't already opened. Also dismisses any alerts if the Monitor Mode icon is currently flashing. Reset Control Panel Window Position: If you ever find the main GWX Control Panel window in a strange location such that it is not visible or cannot be moved due to the title bar being out of reach, this option re-centers the program in the middle of your main display. Doing Save diagnostic info from Monitor Mode does not include any potential error messages that might occur when attempting to delete Windows 10 download files. Please use the option from the main GWX Control Panel instance if trying to troubleshoot file delete problems. Exit: This closes the current instance of Monitor Mode. If you want to permanently quit Monitor Mode, use the Disable Monitor Mode button in the main program window. If you have multiple user accounts set up on your Windows PC and some of them are Standard or Child accounts, there are some important things you should know about how GWX Control Panel works when running under these limited account types. Under normal circumstances (when launching GWX Control Panel from one of the desktop or Start menu shortcuts, or when it loads in Monitor Mode), GWX Control Panel behaves the same for all Windows user account types: It doesn't need administrator permissions when it's just checking your current settings (Monitor Mode never needs administrator permissions). Things get a little more complicated once you attempt to use GWX Control Panel for a system-level change that requires administrator permissions. 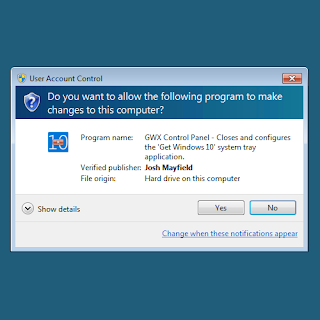 The User Account Control prompt when an administrator account attempts a system change in GWX Control Panel. If you are using an administrator account and User Account Control is disabled, GWX Control Panel will silently grant itself administrator permissions and perform the action you requested. If you are using a Standard or Child account and try to use a GWX Control Panel feature that requires administrator access, Windows prompts you to enter the password of an administrator account. Important: After you enter the password, GWX Control Panel runs under the user profile of the administrator account until you quit the program! Windows requires an administrator password if a Standard or Child account tries to make any system-level changes. In all three of the above cases, GWX Control Panel continues running at elevated permissions until you quit the program. For Standard and Child account users, this can have some confusing side-effects! User-specific settings, like Enable/disable Monitor Mode for current user, will happen under the administrator user's account. The Display the User Guide feature launches the administrator account's default browser with that account's browser settings, bookmarks, etc. The Save Diagnostic Info report will say "User is Administrator=Yes" because Windows is running it under the account of an administrator. The GwxControlPanelSetup installer requires administrator permissions in order to install/upgrade/uninstall GWX Control Panel. If a Standard or Child account uses the the installer and then checks the option to launch GWX Control Panel in the final page of the setup wizard, that instance of GWX Control Panel inherits the permissions of the installer; it runs under the administrator's account. This is why I recommend that you only run the installer/uninstaller from an administrator account. Please see the troubleshooting guide for some more information on weird things that Standard/Child user accounts can experience. 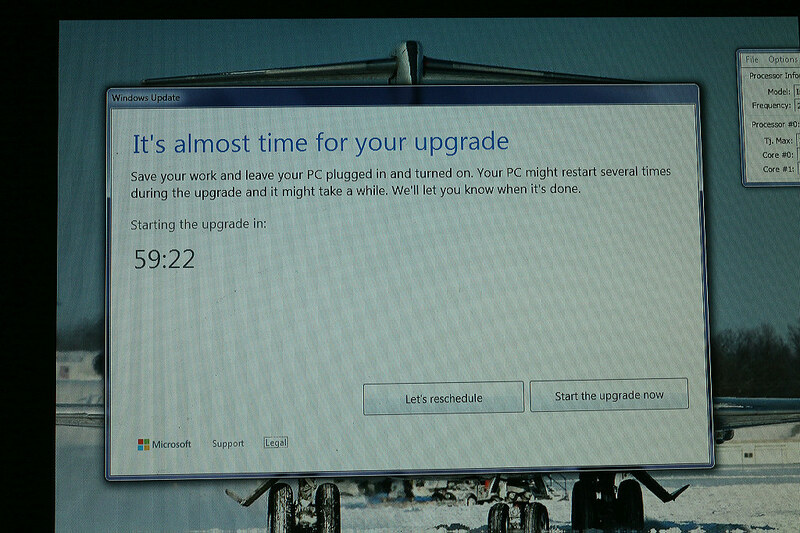 The first time you view the Windows Update screen, it will look as if you had never previously run an update. The first time you check for new updates, it will take longer than normal, since Windows has to download some additional one-time information. The "view update history" list will be empty, and only new updates you install from this point on will appear on it. Note: Your list of actual "installed updates" will not be empty, and previously installed updates can still be uninstalled. Any updates you had previously hidden with the "Hide update" feature of Windows Update will have to be re-hidden if you no longer wish for them to appear in your lists of available updates. The Prevent Windows 10 Upgrades feature puts the correct settings in place to keep your control panel from being hijacked by the Windows 10 Upgrade, and that alone (followed by a Windows restart) should be enough for most people. Sometimes, however, the Windows Update subsystem needs to be refreshed in order to display the correct updates, so that's what Clear Windows Update Cache is for. When you click the button, GWX Control Panel checks to see if you currently have any "pending updates" waiting for a system restart in order to complete, and it will ask if you're sure you'd like to proceed. If you haven't restarted Windows in a while, you should probably click No when you see this message. GWX Control Panel will then ask if you'd like to restart Windows to let the pending updates complete installation. If you just restarted Windows after using the Prevent Windows 10 Upgrades feature and you still get this message, this warning is probably a false alarm resulting from some mismatched files in your Windows Update cache. You can safely click Yes to proceed. Likewise if you just restarted Windows in response to GWX Control Panel indicating that you had pending updates and you're still seeing this message, it is likely a false alarm and you can safely click Yes. Clearing the update cache only takes a few seconds. Upon completion, the information area reports "Operation complete" and indicates how many cache files were deleted. The next time you open the Windows Update control panel, you'll find that it behaves as if it's being displayed for the very first time. Don't be alarmed by the red X! The first time you click Check for updates, it will take Windows longer than usual to download information on available updates. This is to be expected, and only happens the first time you check for updates after clearing your cache. Note: If you experience errors in Windows Update after clearing your cache, these are usually intermittent server-side Windows Update errors that aren't related to GWX Control Panel. Please see the "i used gwx control panel and now i get errors when i try to check for windows updates" section of the troubleshooting guide for more info. I am now maintaining this information in the following post: GWX Control Panel Release Notes and Version History. Platform: GWX Control Panel is a 32-bit application that runs on both 32-bit (x86) or 64-bit (x64) flavors of Windows. Connectivity: The "Display the User Guide" and "Check for Updates" features launch your default Internet browser for different reasons, so you obviously need an internet connection for those. No other features of the program require a network, though. Note about OS support: GWX Control Panel only serves a purpose on Windows 7 and Windows 8.1. According to Microsoft's Knowledge Base article about the patch that installs the Get Windows 10 application, it sounds like the app only installs on Windows 7 systems with Service Pack 1 installed, and Windows 8.1 systems with a different set of patches installed- and it won't install on the Enterprise versions of either OS. I have not personally tried running the program on earlier versions of Windows, but it almost certainly won't run on XP and I received one user report that it doesn't run on Vista. This section will grow as new program modes are added. As with any Windows program, they work from a command line or as additional parameters in the Target field of shortcut properties. /norestart - This switch prevents any possibility of GWX Control Panel performing a system restart. This can help support technicians who are running GWX Control Panel via some sort of remote assistance tool, where slow connections can sometimes result in accidental clicks being sent to dialog boxes such as the prompts asking whether users would like to restart Windows. 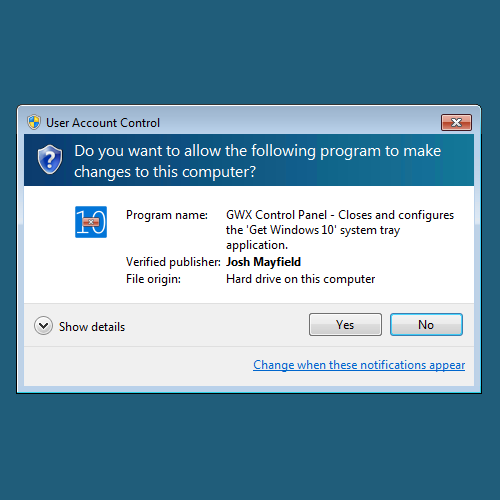 When this switch is used, instead of giving users the option to kick off a system restart from within the program, GWX Control Panel instructs users to exit the program and restart Windows manually. /traymode - Launches the program in Monitor Mode. This is handled automatically if you use the Enable/Disable Monitor Mode button in the main GWX Control Panel window. If you downloaded the stand-alone version: If GWX Control Panel's Monitor Mode is enabled, use the Disable Monitor Mode button to shut it off. Next, simply locate the GWX_control_panel.exe file you downloaded and delete it. 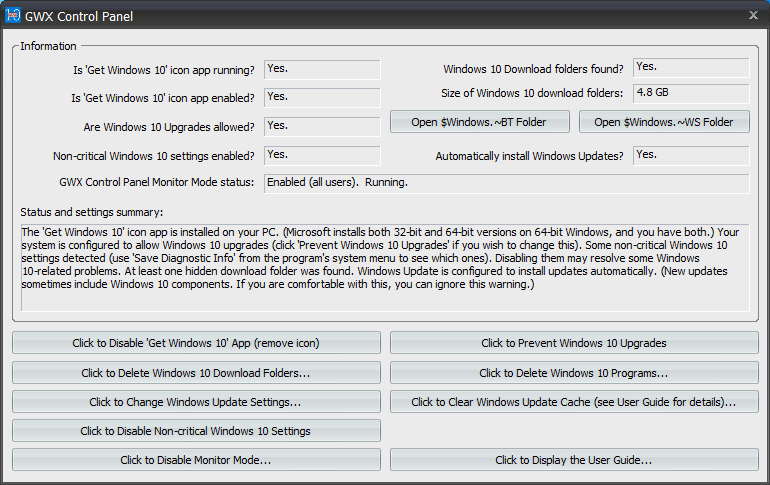 If you downloaded the installer: Open your Programs and Features control panel in Windows. Locate the GWX Control Panel entry and select it. Next, click Uninstall. Optionally, you can browse directly to the install folder (the default location is C:\Program Files (x86)\UltimateOutsider\GWX Control Panel) and launch Uninstall.exe. Beginning in version 1.7 there is also an Uninstall GWX Control Panel shortcut in the Start menu, under the GWX Control Panel folder. I develop and maintain free software on my own time. I don't charge a fee because I want everyone to have equal access to my programs- and unlike a lot of developers of "free" software, I don't bundle any annoying third-party programs, spyware, or advertising with my tools. However, if something I wrote helped you and you'd like to express your thanks in a concrete way, you can send a donation of any amount via PayPal. Support from my visitors covers my hosting and licensing costs, and gives me incentive to keep putting out cool new utilities. If you wish to help out, you can enter a donation amount below and then click on the Donate button. You do not need a PayPal account in order to donate! Just click the "Don't have a PayPal account" option on the page that comes up after you click the Donate button. The donation amount is in U.S. Dollars (USD). Note: You might receive a personal "thank you" from me in response, but I won't sign you up for any mailing lists and you won't hear from me again unless you contact me first. Thanks for your consideration! Click here on the PayPal page if you don't have a PayPal account. Leave a comment here on the blog. Visit the Ultimate Outsider page on Facebook and use the Message feature to send me a private message. If you ever decide to send a PayPal donation (see the "Support GWX Control Panel" section above), you can use the "Send a note to Ultimate Outsider" field on the "Review your information" page to include a personal note. I read and respond to all of those. GWX Control Panel FAQ (Frequently Asked Questions). A lot of information that used to be in this post has moved here. GWX Control Panel Troubleshooting Guide. Go here if GWX Control Panel is not working as expected, or if you believe it is causing problems with other programs or your computer. The original GWX Control Panel announcement page has late-breaking news, usage information, and release notes for all versions of GWX Control Panel. Check out the GWX Control Panel tag to see a historical list of all posts on this blog about the program. Thanks a lot for a great, simplistic and ethical little tool. I downloaded and ran it just 2 minutes ago, and it worked perfectly (and as described). That "Get Windows 10" icon had been irritating me for a while now as I intend to stay using Windows 8.1 as long as possible. PS: I'm not in anyway affiliated with the maker of this tool - I just really liked this little tool, LOL! Thank you for the app. Works perfect. I like the app. works perfectly..
@Thomas - Thanks! It doesn't support command line parameters yet, but that is something I'm considering for a possible update. After learning which file it was initially (months ago) I used 'Everything' file to find GWX.exe and I just deleted them. Problem solved and no one had to write any code. @Jack - Yes, there are ways to take care of the problem manually, but this tool is a convenience for non-technical users. Just wanted to let you know that when I run the app it says that the Get Windows 10 App is running but there's' no icon in my systray for the GetWin10 APp. @bluecollarcritic - when it says the app is running, what happens when you click the 'Close Get Windows 10 App' button? Does the status of the app change? If so, what happened was that the GWX app process was actually running but for whatever reason was not displaying the icon. (You can even hide the icon yourself by modifying your notifications settings, but this doesn't quit the GWX app like GWX control panel does.) In other words, my program checks whether the process is actually running on your system, not necessarily whether you can actually see the icon. Does the program remove that nag that pops every 2 days wanting me to upgrade now or delay for, at most, 2 more days? I have been delaying it every 2 days (at 0500 when the computer is off) for a month or more now. I did get rid of the $Windows~BT folder from the advice of another person's website but the nag persists. Your program shows, in order, (App not found), (App not found), Yes, No, (not found), The 'Get Windows 10' does not appear to be installed on your PC. Please see user guide to see why this might be. And then at the bottom: Disable Operating System Upgrades in Windows Update. I haven't done anything further. @Bill - This "nag" you're talking about- does it look like the screenshot with the on it at the very top of this article (the picture with the stopsign on it)? The little square, blue & white window that pops up from your notification area? Also, do you currently see the white Windows 10 icon in your notification area (also shown in the screenshot). If you are seeing that icon and that same notification, but GWX Control Panel is telling you "(app not found)" then you may be experiencing something I haven't encountered yet. I might have more questions for you if this is the case. No, it's a separate window, large, no stop sign, pops up out of nowhere. On the left side, it has a pull down so that I can change the date of the install (only 2 days at a time) and the time that I'd like to do it. The right side has an Install Now button. The Windows icon in the notification area is gone. Download Win 10 but don't install it. Wait 2 days and you'll see the window. For me it pops up several minutes after the PC finishes booting. It will self-install Win 10 in an hour and shows the count-down. @Bill - It sounds like your PC might have inadvertently installed the special "Upgrade to Windows 10" update which puts your PC into a mode like you describe. (It is possible for this optional update to be automatically selected and installed without your consent, although I don't think we know the complete array of scenarios where this occurs.) Unfortunately GWX Control Panel can't help you once things get to this point; Microsoft's already made changes to your system that I don't know how to reverse yet. My program can prevent your computer from entering this state if you use all its "disable" features before the "Upgrade to Windows 10" update is applied, but it can't back you out if you're already in this "impending upgrade" mode. I've heard from one other person who's in a similar situation, and I'm going to try to take some time to look into this more over the weekend. There might be something I can do, but it will require an update to my program if I figure out a solution. Also, if you have already removed the hidden Windows 10 install folder, I don't know what will happen if you let things proceed. Will Windows re-download Windows 10, or will it just abort and let you keep Windows 7? I might try to experiment with this too. I took a DSLR photo of the pop-up window about upgrading to Win 10. Do you want to see it (some how)? I delayed again for another 2 days. Didn't even turn on the PC yesterday. @Bill - Can you upload the image to a free image sharing site like imgur.com and give me the link? I checked Windows update and found KB3035583 on the installed updates list and uninstalled it. I made the mistake of rebooting before going to disk cleanup. Once rebooted, I did go there and eliminated temporary internet files (and some gaming files that I don't use). It took awhile to reboot again, but I'm finally back on. KB3035583 no longer shows up on the Windows update installed list. The upgrade icon no longer shows up on the system tray. However, when I go to Windows Update, it still shows the box that says Windows 10 Upgrade is ready to install. This, apparently, is blocking my normal Windows update. So..please advise on how to fix this? If I were to download and use the GWX control panel, would that be able to fix it? I appreciate your advice and thank you. I don't know what to tell you. I am still getting the nag window about installing Win 10 (on this Win 7 Pro PC). The nag shows up around 10 minutes after the boot-up is finished. I just reschedule it for 2 days later. I looked to see if the Bt~Windows folder has reappeared but I can't find it. I noticed that the KB...83 file was installed in early July, a month+ before I downloaded Win10 so I didn't operate on it. Someone mentioned in a blog (or whatever it was) about two other KB files but I never found them. All I want to do is get rid of the nag screen, but I haven't been able to do it or find someone who has (or even mentions the nag screen). My computer just kept slowing down and I suspected that the software trying to get me to upgrade to win 10 was partly responsible as it got more and more insistent. The software works perfectly and my computer is back to normal. Many, many thanks!!!!! Hello Josh, my friend Woody advised I contact you. I ran GWX Control Panel but there is nothing there for the program to remove. I'm stuck in the final loop of the Windows 10 upgrade cycle. Can't get rid of it. When booting up I get a box telling me W10 is going to install in 59.59 minutes. I can only postpone this by "Rescheduling" to 72hrs later. If, by accident, I get called away from my computer from more than 1 hour when this box pops up W10 will install. Meanwhile Windows Update blocked by the W10 upgrade. I read somewhere that if you removed the W10 download (as I did which is why GWX can't find anything) and you just let this countdown come to zero... nothing will happen because the W10 install files are no longer there. BUT IS THIS TRUE...? J.D. As to your second question, I don't have the answer: It's possible Win 10 won't install if you've already deleted the 6GB hidden install directory- but it's also possible Windows will just re-download it and force you to upgrade. This is another thing I am looking into, but don't have the answer yet. Thank you for your quick reply. Unfortunately I didn't know about GWX Control Panel until it was too late. I know I'm not the only with this problem and I hope you'll be able to find a fix. Shame on Microsoft. J.D. I think this tool is very helpful to handel the problem Windoes causes! But: I ave download the prog and try to start: sometimes it starts, sometimes not, i.e. it starts everytime (I see in task manager), but the surface doenn't come on screen sometimes. Couls you gelp with a solution or hint, what the reason could be: other running programmes, anything else? @Robert- Sorry, I meant to reply to this yesterday. What you describes sounds like a possible problem with window positioning? I'd suggest trying this: 1) Restart Windows or use Task Manager to make sure that no instances of GWX_control_panel.exe are running. 2) Open Registry Editor (regedit.exe) and browse to HKEY_CURRENT_USER\Software\UltimateOutsider, right-click the "GWX_control_panel" folder, and then click Delete, followed by clicking Yes. 3) Close regedit and any other open windows so that you can see your entire desktop, and then launch gwx_control_panel.exe. The program should appear in the center of your viewing area. Hi UO and thanks for hints, but doesn't work for me. Have done so and the pgramme apperas once OK, after shut down it never agein, although the key in registry still not exists. Try starting after booting the system: no success. Download the exe file again and start it from download folder ( I have to indorm: the first downloaded exe file I put in a folder in programmes, i.e. at another place) - the programme starts once properly, try to start again: the same scenario : no chance to start it again. Thereafter the programme seems to be ›dead‹ or even not visible. But the question is: does it work regarding the settings? ... have to make an addition: whean I wrote ›not possible to start‹ it means: the programme runs (active in task manager), but no programme window is visible. Does GWX Control Panel install anything that starts with Windows? Like in autostart och system service? Or is it just doing its job en then exits? Maybe this already is explained, I haven´t found it though. @SL - No, it doesn't install anything. Any actions the program performs are only done while it's running, upon your request. If I ever have to add a feature that requires some process to be running in the background in order to be effective, I will be very clear about that- and will make it an optional feature. First off let me say I donated you 2 dollars at Paypal, and when I grow up I wanna be just like you. They have STOLEN COUNTLESS pieces of my work over that time, as I have continually deleted my hard work, MP3s, JPGs...whatever to try and keep myself having some space to do my music on my small 218 GB computer, which has continuously been hitting me with paging file errors on startup, and disc cleanup notifications, while I work in Protools. As I said, IT IS A WAR against these government FBI Pigs at Microsoft (who are also I'm sure the same who are causing the Syria Refugee crisis). Just yesterday I managed to find some Protools files, where I had been working on some pop music...they added up to quite a lot, and I managed to free up an amazing 4.75 GB! 4.75 GB right when I need it. Then last night (remember it was less than 24 hours after clearing those 4.75GB) and am working...and all of a sudden I push Record, and Protools hits me with can't record low disk space alert. Of course when restarted, my drive space was back up to 1.12 GB. Before shutting down, that went back up to 3.8 GB, still about 450 MB less than it should be considering I had only recorded some 500 MB of WAV files since the clearing of the 4.75. This morning again I logged on and found 2.8 GB back on . So since this has been ongoing I made a plan to solve this space problem making a "Copied files to delete" Library, and a new folder on my desktop, where I also found some other things I could delete. I have now copied over 5 GB into that file folder today, to delete later when necessary. This is the only way I can stop the machine from continually eating up my disk space. This as I said is a war. Going beyond spying, which I am sure they are also doing with their new 10 update. Sorry for the long winded ness of this but I wanted to vent, and I did give you 2 dollars of my remaining online funds, that is 1/3. Tegnap nálam is betolakodott a Win-10 "frissítés", de nem engedem feltelepülni. Nagyon megfelel az asztali komputerem eddigi Win-7 Ultimate változatban! "Computer Configuration > Administrative Templates > Windows Components > Windows Update"
If I do a rollback of Windows 10 to a previous Windows version, do I still have to use GWX Control panel to prevent The Windows 10 update to reappear again or does Microsoft understand that I don't want it and then disable the upgrade for me? Thanks for creating the app - a great service to the community! I've seen several references to deleting the $Windows.~BT folder, and on 3 October you mentioned that you planned to look into the implications of doing so. I was wondering - have you had a chance to do that yet, and if so is there anything useful to know? I'd love to free up the space on my HDD. 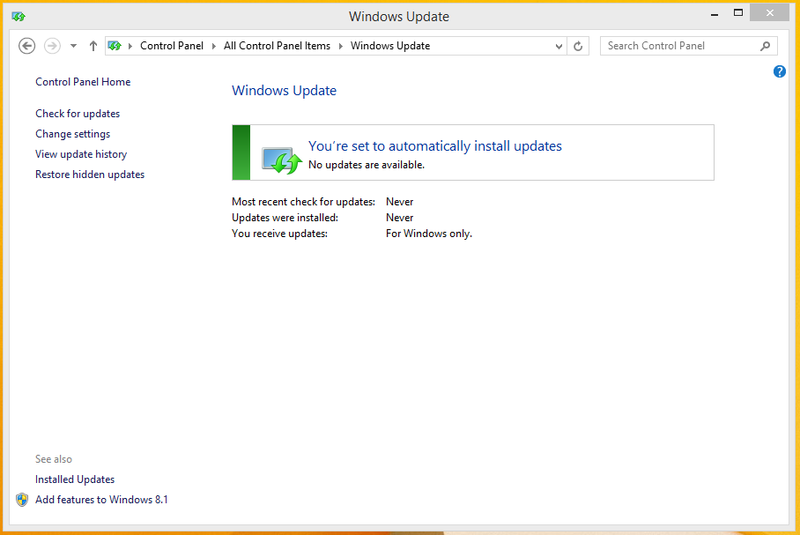 @JohnPD - The "Windows Update OS Upgrades are enabled" message can actually indicate a couple of different things. It can mean that the Windows Update control panel can potentially change to the mode where it defaults to upgrading Windows 10, but it can also mean that Windows is set up to allow the background downloads of Windows 10. If either (or both) of those settings are found to be enabled, you'll get that result. The policy editor change you made only handles half of the equation. @adc in Boston - No, I haven't personally experimented with it, yet, primarily because I leave my test computers alone, and just check if Microsoft has changed the GWX Control Panel settings after applying Windows updates. I don't have plans to remove the directory as part of the tool; but also don't yet know what the effects of a manual removal are. I had a similar problem way back at the beginning of August and posed a question in the Microsoft Community forums. Andrei Stoica provided me with a solution and I have had no problems since. I believe this solution can be added to the GWX Control Panel software. Here is the link for all concerned. I'd also agree that possibly the registry tweaks mentioned in the link above (post by Hyam Miller) may be able to be integrated into GWX Control Panel as a way for those who are "past the point of no return" to stop the Win 10 upgrade from proceeding. For those interested in removing the Win 10 download ($Windows.~BT folder) from their PC's, Microsoft gave us a way to do so. Click Start, Type Disk Cleanup in the search box, run it and select your boot drive (normally c:). it will scan for a while, then present you with a result. On that screen, click Clean up System Files, Select C: again and wait for the scan to complete. of the result screen, select "Temporary Windows Installation Files". For best results click the rest of the boxes as well. The "Temporary Windows Installation Files" is the Win 10 upgrade files (5-6 GB on some systems). If you check all the boxes, it will also cleanup your existing Win 7/8/8.1 environment and some of the potentially bloated parts of your existing windows installation, like the WINSXS directory. Overall, it can be a good thing to run once and awhile on your system. Be advised that if you do check all of the boxes your system may appear to hang on reboot on a "configuring windows update" screen and also on a Cleaning Up" screen. If this happens, don't worry. The system is just cleaning up and will be back to normal in a while. Win 8 or 8.1 does take a much longer time to get through these processes and I've seen it take as long as 15 minutes or more to process on a slower system with a lot of files to cleanup. Once you've suffered through the delay, your system should run better as you've removed a lot of the unneeded files that waste space on your boot drive. @Hyam and @Chuck - Thank you both for the helpful comments. I am gearing up to do some deeper investigation into these matters and have noted your suggestions. Going to see what we can do to bring unsuspecting Win7/Win8 users back from the brink. Good Work! A lot to read. I find that using your control panel and disabling Win 10 upgrade, my Win 7 "seems" to be running "smoother" again. Thanks! Just a question, by disabling "Windows updates" will this compromise computer security? I already have an antivirus program. Thanks. I downloaded this and did what it said. Thought my problem was solved. When i went to download my updates Windows 10 upgrade still tired to install. @Lucy - There are still a couple of specific situations that my program unfortunately can't yet fix. I have screenshots of the kinds of behavior I can and can't fix under "WINDOWS IS ONLY GIVING ME THE OPTIONS OF RESCHEDULING OR IMMEDIATELY STARTING THE WINDOWS 10 UPGRADE: WILL GWX CONTROL PANEL HELP ME" in this post. Are you seeing something different from the pictures shown there? If so, I'd like to know exactly what kind of behavior you're seeing, please? Looks like Microsoft is now calling this a "mistake". Hello. I was surprised to see that GWX_control_panel.exe will not run (on Windows 8.1) if the host uses an AMD A8-6410 APU with AMD Radeon R5 Graphics processor. FYI. @decaffeinated - GWX_control_panel.exe is just a typical x86/Win32 app with no special dependencies. What exact error message or behavior are you getting? Thanks for a helpful tool. On this page in various places are thoughts about should or shouldn't the $Windows.~BT folder be deleted with no feedback from anyone who has done it. How about the GWX folder in \Windows\System32\, have you or anyone experimented with deleting it? Both folders will force you to find a way to change permissions (which I haven't figured out yet). I've popped a shortcut to GWX Control Panel in my Startup folder, no harm in running it daily for a while till this mess is sorted out. This forced upgrade is the kind of thing I'd expect from Apple, not from Microsoft, but things change. @Ultimate Outsider -- Something along the lines of "this program is not compatible...something...something...contact your vendor for a compatible version." Sorry, I did not copy down the error message or think to obtain a screen shot. The PC in question is one that I sometimes remotely "administer" for a non-techie friend who has a day job and is sleeping now :-) . I initially thought maybe she had an ARM host, but Classic Shell installed w/out a hitch tonight on her laptop and the Computer Properties dialog box showed an AMD host (not ARM) instead. Does your program use the latest and greatest version of the .Net framework? That might be an issue...for her laptop. Thanks. I see that the "HKLM\SOFTWARE\Microsoft\Windows\CurrentVersion\WindowsUpdate\OSUpgrade" "AllowOSUpgrade" key was changed from "1" to "0". I am not sure what the GP change modifies in the Registry if anything. I did this. Clicked " Close Windows 10 APP Temparally Remove ICon"
Clicked Disable Get Windows 10 APP. Clicked Disable Operating systems Upgrades in In Windows update. Then restarted my compute. I noticed my windows 7 updates were installed expect 3. When i went to install the updates the last 3. I got the normal screen for windows 7 updates. When i click to install them. The white Upgrade 10 Pro came up. So i clicked stop. So that is what I'M getting. So i can't click my Windows updates on because I'M scared my system will upgrade. Thank you for creating and sharing this great tool. I ran it and it worked perfectly. One question I have is whether or not disabling OS upgrades will prevent installation of the telemetry collection updates that Microsoft is trying to force onto computers running Windows 7 and 8/8.1. I have had to research every new update to make sure I am not inadvertently installing any of them. Can I stop doing that now? Josh, Thanks for this great app. It did remove the Win 10 icon from the system tray, and I no longer see a request to upgrade to Win 10 when I open Windows Update. I get the regular screen where I can select updates. However, no matter what updates I select, as soon as I select to install updates, it starts downloading Win 10 upgrade files. There is no Win 10 Upgrade option listed among the updates. It is apparently forced to be included with no warning or option to remove. It does announce that it is downloading Win 10, and so far I have canceled there before I got to the ready to upgrade screen of no return. I hope you can find another setting that will take care of this. @Lucy - You are not alone, and I am currently investigating how to get out of your particular situation. Check back here in a few days and hopefully I'll have a solution. GWX Control Panel is effective in at least three use cases on Win 7/Win 8 (the ones I originally designed the program for), but I'm aiming to support at least a couple more, including yours. @Mark - My comment to Lucy also applies to you. Hang tight, we're trying to figure this one out! @Onyx - That's a good question, but unfortunately the current situation is that if you download Windows Updates now, you are always going to be at risk for getting new stuff that doesn't make your user experience better, but only helps Microsoft figure out new ways of getting you onto Windows 10. I still cannot recommend disabling Windows Updates, because some of them truly are super-important security fixes that you don't want to miss. The safest way to go is what you're probably doing now: Set Windows Updates to download the patches only, only get important updates, and then research the individual patches and choose which ones you actually install on your PC. In the future I might be able to add some "watchdog" features to my tool that can give you a heads-up whenever Microsoft does something that's known to put your Win7/Win8 install at risk. Also, I do not currently have any logic that specifically targets their telemetry features. @decaffeinated - What are you using for remote administration? I have tested gwx_control_panel remotely over Windows Remote Desktop, but not other environments. It does request elevated permissions when launched, which might be an issue with some remote clients, since that temporarily overrides portions of the Windows UI. Also the user account launching the process needs Admin rights. @ dsrcurator I did the same removed KB 3035583. Didn't help! @Ultimate Outsider Okay thank you. I'll check back. Some people keep telling me that Windows 10 can't upgrade on to your computer unless you ask it to. Bull crap. some people don't understand. I hope you can find something to help the problem. @Ultimate Outsider, thank you for your kind reply, and thanks again for sharing your great work. Your efforts are very much appreciated. Thanks so much. We feel helpless against Microsoft, and we really appreciate someone with your knowledge trying to help us out. I will keep checking back. @Ultimate Outsider, I am using TeamViewer. The owner of the laptop runs with Admin privs (i.e., she is an Administrator). I used her login to install Classic Shell via TeamViewer--no issues. I downloaded and ran gwx_control_panel on two other hosts last night via TeamViewer (one Win8.1 host and the other Win7) and there were no issues. The only problem popped up on the AMD Win8.1 host. Thank you for sharing your time and talent with us. Win10 bit the dust last night and I am free of torment. I am going to pay it forward in your name and infoworld's... what a gem you two are! I really hope you find a way too fix this problem. Chuck Orton's suggestion (above) worked like a charm. It cleaned out all 5 GB of the download ($Windows.~BT) folder and left nothing but free space! @ Chuck Orton! I did the disc clean up. but i didn't find the " Temporary Windows Installation" tho. I just tried. It's asking me for Administrator permissions. Even though I should already have privileges, I've tried modifying the security properties but it still won't take. You essentially have to run the application twice. Run it the first time, and then when you get the results, look at the bottom of the box where it says "clean up system files." Click on this and it will do another scan to find files to delete. It may take a few minutes. When it is done, check all of the boxes, on of them should be for the update. @adc - I'm not sure exactly what you're describing, so I will cover the bases: If the User Account Control feature of Windows is enabled, Windows will always ask "Do you want to allow the following program to make changes to this computer?" when you launch GWX Control Panel. This is just the operating system giving you a chance to choose whether to allow the program to run. Just click Yes to proceed. If you are clicking yes and it's STILL not working, my first guess is it's because the user account you're running from is not an Administrator account. You can verify this in the User Accounts control panel. It should say "Administrator" under your account instead of "Standard user." @Ultimate Outsider: Apologies for being unspecific. I was posting just after a comment about deleting the $Windows.~BT folder. It was my attempt to delete that folder to which I was referring...Windows won't let me do it, no matter how much I reset my privileges. This is a private machine, and I am the only user. @ John! Okay thanks i did scan a second time. Just a quick question: I still not able to do Window 7 Updates. It wouldn't be safe doing it off of the Microsoft website? I would still get the Windows 10 Upgrade? I send Microsoft a comment on FB to tell them i'M not pleased with them "forcing" users to upgrade. They told me to PM them the problem. They NEVER answered me. I tried everything to stop the nag box, but when I saw that 2 gig ready to download I was freaked out! Two local IT guys said there was nothing I could do, then I saw your link in a computerworld.com article. I tried it, it was so easy to use, and no more WIN 10 attempts to install. If you ever decide to rename the program again, I suggest "nuke windows 10". Have helped friends run this on about 6 computers now, all happy campers! I hope Scott Adams finds a way to mention your program in his Dilbert cartoon! Oh there nothing you can do to get rid of the Windows 10 upgrade? I still wish i could download my updates but i can't because of the nagging Win 10. @Lucy - Some time today I'm going to post a special beta version that I think/hope will fix your issue. I will post a link to it here in the comments. Josh, I just tried again. I ran the Windows Update fixit in administrator mode. I even downloaded the latest Windows Update client. I then checked with GWC Control Panel again, but my settings had not been changed. Despite all that,I still get a message that Win 10 upgrade is downloading any time I run Windows Updates. I cancel as fast as I can. Curiously, it reports only the number of updates I checked, whereas the first time I did this last Thursday it had one more update (the hidden Win 10 one). Anyway, it sounds like you are perhaps close to a solution, and I will look forward to that. If you don't think there is a solution, I guess I could try doing a full disk restore to last Monday -- before the updates that led to these issues, and then use GWC Control Panel to turn off Win 10 icon and updates before I even open Windows Updates. That is a big task, and I am not sure it will work anyway, so I will wait for a while to see if you come up with something. If you get to the point that it looks impossible, let us know and I might try that, or perhaps you can suggest some variation that is better. Thanks again for your help. This has really undermined my faith in Microsoft that they are causing this kind of behavior and not providing a fix themselves. Many of us are so thankful for people like you with the expertise and willingness to assist. @Mark and @Lucy - Please check out this post. There's a link to the new beta version of the program, plus instructions on what to do and what to expect. I really need some people to check it out and let me know if/how it works, because I'm still having trouble getting my own machines into the same bad states that some of you are dealing with. Thanks! Also, the download link to the beta version is in the "Instructions" section of that post I just linked to. It's not available from our main downloads page. Okay i will look at it thanks!!! 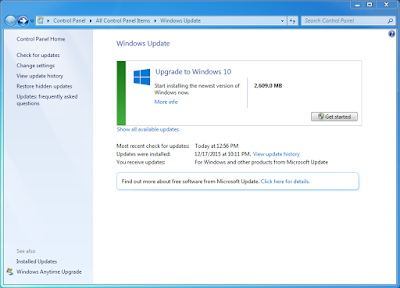 What, exactly, does "Are Windows Update OS upgrades enabled?" check for? My PC is configured to notify but not install, and it's also configured NOT to get "recommended" updates the way that it gets "important" updates. Right now, GWX Control Panel answers the four questions as follows: (1) (App not found); (2) (App not found); (3) Yes; (4) No. I'm not sure what is triggering the affirmative answer to (3). I haven't seen any other signs of Windows 10 on my PC -- no nags, no notifications. But I'm still concerned about its report that Windows OS Upgrades are enabled; I don't see any other evidence of that. @Marty- I'm faced with the problem of how to present the simplest possible user interface to represent something that's growing increasingly complicated the more I learn. Assuming you're using version 1.3 of the program (the current "official" release available at my downloads page), you're seeing "Yes" for "Are Windows Update OS upgrades enabled" because you are missing a specific setting that prevents secret background operating system downloads. This setting is not there by default (the downloads are implicitly enabled), so while you may not have any of the actual Windows 10 upgrade tools on your PC yet, you're not explicitly blocking them yet either. If the field reads Yes and you don't do anything about it, are you definitely going to get the secret downloads? Possibly not- but that depends on a lot of things, including whether Microsoft thinks your computer will be compatible with Windows 10. Using the "Disable OS upgrades in windows update" will put the change into place. The next version of GWX Control Panel that goes up actually checks for many more traces of potential vulnerability (or detected activity), so it will be even more likely to report "Yes" for that field, but this is just because I'm trying to cover all bases. Hi and thanks for your hard work and for this marvellous little tool but I would appreciate your advice. I’d already uninstalled KB3035583 twice before I found your page. Will GWX still work properly even though I did this or should I reinstall KB3035583 and then run GWX control panel again or is that too much of a risk? I don't have the Windows10 download folder on my system. Before running GWX Control Panel the "Upgrade to Windows 10" notice was showing in Windows Update. I have disabled that on GWX Control Panel. I have Windows Update set to "check for Updates but let me decide whether to download and install" but I'm not getting any updates - not sure if this is because there aren’t any updates. Would really appreciate some advice. Thanks. @Clare - While the "Disable 'Get Windows 10' App" feature only works/serves a purpose if you currently have KB3035583 installed, from my own tests I've found that if I let KB3035583 install and then use the "Disable 'Get Windows 10' App" feature, I won't ever see the icon again, even if Microsoft re-pushes that patch like they did last week. While this could change in the future (if Microsoft tweaks their patch to behave more aggressively), so far it's actually been more convenient for me to just let the patch install on my systems, and then disable it. I don't have to cherry-pick or hide any updates; just let them install normally and then re-check my settings now and then. Regarding your second comment about not getting any new updates- if Windows update actually tells you "No important updates are available" then you are in good shape; you'll only see that if your computer is properly communicating with the update servers. If you're seeing something else, I'd like to know more details- and there's a chance the beta version of GWX Control Panel could actually help. Thanks for your advice. In view of what you say, I think I will go ahead and reinstall KB3035583 and re-run GWX Control Panel. Regarding your reference to "a specific setting that prevents secret background operating system downloads", could you elaborate on that a bit without compromising your project? I'm as paranoid as anyone when it comes to M$, but it sounds as though you're not referring to a Windows Update, either "important" or "optional". I like to know what changes are being made to my machine when I run a utility, so if you could describe that "specific setting", I -- and probably others too -- would appreciate it. In any case, thank you for the splendid public service that you are providing. @Marty, the setting is called "DisableOSUpgrade". There is information about it online. As a former C and Intel Assembly Language Programmer retro'd to Windows Power User I reccomend this software as it worked perfectly on my 1st try! I got here indirectly by Google Search for "Get rid of GWX" and Woody's article in INFOWORLD mentioning your 1st stab at this with GWXStopper! BTW! I went on my Fathers desktop that runs Win 7. I noticed i was able to do updates still normal with out the Windows 10 Upgrade. I guess not all computers have that problem yet. I still may download the GWX Panel thing for when or if it does creep on. @Lucy - Yeah, some aspects of the Windows 10 upgrade push are still a little mysterious. Microsoft has their own plan for when different computers will be affected, and how. Excellent finally I got rid of the pest (Win 10)It was easy to do away from this monster. Great work . I tried 1.3 and it worked perfectly . I have rebooted several times and checked for Windows updates in the past 24h with no problems appearing . Thank you so much for your time and efforts for so many people who do not want something but it will be pushed down their throats . God Bless You . Like others on here I’ve tried everything to stop the “Downloading Windows 10” event every time I try to install the current updates to Win 7. 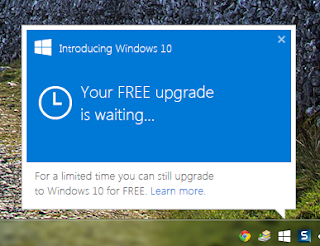 I’ve never asked or intimated I wish to upgrade to Win 10. I’ve cleared the cache and tried everything else but now have about 20 Win 7 updates I can’t install and to cap it all Internet Explorer has now become unstable. Anyway nice work so far. 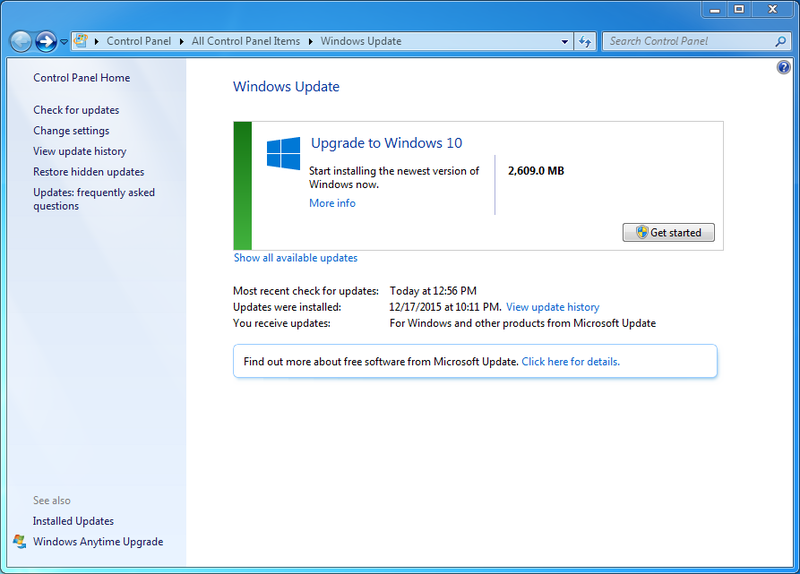 I used your new 1.4 version yesterday to clear off the nasty Windows 10 upgrade from my Windows Update Panel. I had worked with Microsoft a week ago to no avail to remove it and they uninstalled KB03085583 and one other. Your code worked perfectly and I now have a normal looking WU panel. I also got back the notices about updates being available which I had not seen for months. Thank you for your efforts. Since the Get Windows 10 app is no longer on my pc, what do I have to do to get the Windows 10 update when I am ready? Thanks again. @Dve - Are you saying that after trying the Disable OS Upgrades and Clear Windows Update Cache features of version 1.4 of the program and restarting Windows you are still seeing the Windows 10 upgrade in your Windows Updates control panel? If so that is very unusual; soon I'm going to add a feature that can save a snapshot of your settings, which you can mail me- this might help me figure out if I need to add any more protection to the program. @52Yankee - Thanks, and if you don't have the Get Windows 10 app anymore (Microsoft will probably try to re-download it to you at some point), you can always create new Windows 10 install media and use that to perform your upgrade. Search for the Microsoft article called "Installing Windows 10 using the media creation tool." Excellent program AND documentation. I totally agree with your comments regarding the design and methodology of the Get Windows 10 App. One side-effect of the 'CLEAR WINDOWS UPDATE CACHE' is that the list of Hidden Updates is also lost, so users may want to rehide updates that had been hidden before the cache was cleared. "@Dve - Are you saying that after trying the Disable OS Upgrades and Clear Windows Update Cache features of version 1.4 of the program and restarting Windows you are still seeing the Windows 10 upgrade in your Windows Updates control panel?" Yes however there is no sign of the "Downloading Windows 10" when windows update opens, it just contains a list of the available uninstalled updates until you try to install them then you cant. It just reverts to downloading Win 10. I'm on Win 7 Pro and am a software delevoper (.NET) with a ton of development stuff going back years. I've transfered WIn 7 Pro (Retail licence) to a few different machines over the years as well. This is probably not helping I suspect. I'll keep trying though as and when I get time. Thanks for putting this tool and detailed instructions online. Very helpful. You Da' Man! Most abundant thanks for your efforts to stop Windows 10. I am so mad at Microsoft I cannot see straight. I uninstalled KB3035583 at least twice. Then I discovered the Get Windows 10 notification was back. I am appalled at Microsoft's very unethical approach to invading my computer without my permission. Regardless of cost, my next computer will be a Mac. I have had it with Windows. Its buggy and requires constant maintenance. A user should not have have a computer engineering degree to operate their computer! Re, my previous posts – the culprit was AVG Tune-Up (2014). This was interfering with the Win 10 updates and Win 7 downloads. Strangely not only have I ever installed this programme, it never showed in Control Panel > Programs and features, until I found it in the registry. It was installed on my machine in July this year probably (I suspect) either by an Adobe update or Google. I am typing this having now installed all the Win 7 updates but have not yet re-booted. I will get back to you if this has cured the issue. My machine is now working correctly. The Win 7 updates are back to normal and the "Downloading Windows 10" has now dissapeared. 1) I do not steal software. 2) He took the time to write a solution to a problem that SHOULD NOT even exist, but it does. 3) GWX Control Panel is an elegent little tool that appears to do its job. 4) I had an explicite need for this tool because I do not want to upgrade my Windoze 7 machine to Win10. I have upgraded three other computers in my home to Win 10 and we all love Win10. Win10 is NOT the issue. The issue is MS forcing me to upgrade a box that I do not want to upgrade. Why I do not want to upgrade my own Win7 box ix my business, not MS's nor yours. 5) I like Ultimate Outsider's model: Build it and they will come...with their PayPal account. Here, Here, Yes Indexmill Ultimate Outsider did a great job fixing people's problem. Something that worked. @Indexmill and @Lucy - Thanks so much! Many thanks! You have done a great job with GWX_control_panel. Used it on all my Windows 7 computers ; it saves having to manually change the registry, which I try to avoid. Refresh = 00000001 which existed before. I have reset manually the pair of entries (KickoffDownload and Refresh) to 00000000, and now it seems stable even after reboot. I will continue to monitor the stability of the settings, though. Regarding KickoffDownload, my program can't set that to anything other than 0 and it doesn't currently have any post-reboot logic, so if that value changed to 2, it wasn't me. @ Ultimate Outsider you're Welcome!!! The Open Folder button opens the hidden folder C:\$Windows.~BT and reports that its contents are 160 MB. However on my Windows 7 Professional computer there is a another folder with a similar name C:\Windows.~WS that contains 5.79 GB. This folder was created on 29-JUL-2015, the day Windows 10 was released, so I think it is the Windows 10 installation files. Shouldn't this folder also be included in your GWX Control Panel application? @Kevin - Interestingly, I was researching that other folder over the weekend, and I had concluded that it would only exist on a computer that had already upgraded to Windows 10. (I haven't found it on any of my computers, and couldn't find anyone discussing it online who was still running Win 7 or Win 8.) But if it's appearing on Win 7/Win 8 systems, I definitely do want to detect it. About 2 Saturdays ago (10th), I booted up and waited impatiently for the nag screen. About 8 minutes later it showed up but in a different format. Gone was the Start The Upgrade Count Down Timer. This time I got a simple delay until later (or words to that effect) on the left hand side of the nag. I certainly checked it. @Ultimate Outsider. Thanks for the reply. So far no one else here has reported on this folder in your blog's Comments. BTW, I typed its name incorrectly. I should have typed C:\$Windows.~WS . A search online for this folder name turned up quite a bit. According to one post the folder is created when running Microsoft's Media Creation Tool. This folder is not deleted by Windows' Disk Cleanup, so some people have deleted it manually without any ill effects. Just great! Looking back thru protools found a stereo track from 2013 thats 3.565 GB. Thats 3.565 GB per channel...and its a four minute tune followed by huge long silence. Musta got called away. Goin in to do a clear unused now..
Hi, Mr Outsider. I've been using this excellent utility for quite a while on all my PCs and all of my clients machines, too - and it has always worked flawlessly. But this morning, when I went to view my outstanding updates in Control Panel on my Surface Pro Mk I, I was somewhat disconcerted to see the 'Windows 10 is coming soon' advert, with the 'Show all available updates' button beneath. I immediately ran your tool and sure enough it says 'No' in all four boxes. I thought you'd like to know about this. I appreciate you don't want to say negative things about MS, as you have contacts there, but this upgrade pusher exhibits nearly all the symptoms of malware, and is regarded as such by many working in infosec. As a knowledgeable power user I really, really resent having this pushed down my throat. I look forward to a future update that really and truly *stops* all attempts to push this nonsense to me and my clients! Great work so far though. 1) "disable OS upgrades in windows update"
But I still can see a bunch of telemetry and "update client" updates. I've hid a bunch of these updates again and installed new updates, but after a reboot the hidden updates are not hidden again and the update log doesn't list the recently installed updates. (but I can see them in the control panel/uninstall utility). How to make windows update log the updates like it did before? @gendalf - Two things. First, you don't have to manually alter that group policy setting. Under the hood, GWX Control Panel's "Disable OS Upgrades" feature changes the same setting that the Local Group Policy Editor sets when you enable the policy. (That fact just isn't apparent inside the policy editor UI.) Manually enabling the setting won't hurt, it just doesn't do anything extra if you've already done the "Disable OS Upgrades" in GWXCP. Regarding the "Clear Windows Update Cache" feature, this does reset your list of hidden updates and the update history. Both of these lists will repopulate over time as you perform subsequent updates and hide other patches. (My apologies if this wasn't clear- I mention it in the section about this feature, but my wording might need some fine-tuning.) As you mentioned the "Installed Updates" list is still available/doesn't get reset, and you can still uninstall individual updates that way. After I've installed new updates, it doesn't log them into the 'windows updates history' interface - it's still empty. While I doubt this was the cause, you can reverse any registry settings GWXCP makes by just using the "enable" feature for anything you'd previously disabled. This of course doesn't undelete your Windows Update cache files, but for extended diagnostics/troubleshooting you can try running Microsoft's Windows Update troubleshooter (should be top search result for "Fix Microsoft Windows Update Issues"). @gendalf - That's why I suggested the "Fix Microsoft Windows Update Issues" troubleshooter. You should only have to hide them once after clearing your cache and checking for updates. If it's not "sticking" that isn't normal, and you should try the Windows Update troubleshooter. Thank you sir for your kind work. Hi, I've put together a list of steps that I have been doing to help prevent and prohibit the Windows 10 Sneaky Upgrade. Start with this Ultimate Outsiders GWX (Win10 preventer) Control Panel. (a) Optional updates, and (b) Installed updates. Find: "Microsoft Compatibility Appraiser" and "ProgramDataUpdater". These may help to get you out of trouble. Hope this helps. Your experience may vary, (i.e. cannot guarantee results, but its working for me.) Best of luck. Just wanted to drop you a quick note that I really respect what you have done for the Windows OS community with this app. Thank you very much. Thank you so much!! That constant nagging was driving me nuts. I have ZERO interest in upgrading to Windows 10 and wish MS would just leave me alone. It worked!! Thank you so much for fixing this forced upgrade. I am very grateful. Wonderful, well worth my donation. Had to run several times and clear the cache, but all is now as I want it to be. Just one question - I had to download the program after each restart because I couldn't find it anywhere on the PC. Is that how it is meant to be, or is it my stupidity? Wonderful utility - many thanks. The notes on the new v1.4 feature "Clear Windows Update Cache" imply that you will be asked if you wish to proceed. However this only happens if there are pending updates. If there are no pending updates the GWX utility asks for no confirmation. Can you please consider adding a warning prompt as not even system restore can undo what is about to happen. As stated in the notes you loose all the Updates History and any updates marked as Hidden. By the way the big trouble with Win 10 upgrade is unless you updated every device driver including your MB by downloading from the vendors web site and installing each one then the upgrade to Win 10 eliminates everyone that had been automatically done by Windows. You get no errors or warnings but devices just don't work including portions of your MB. If you get Win 10 then you need a 3rd party driver program. A big thank you for your efforts and generosity in helping many windows users not wishing to upgrade. I perhaps foolishly rushed in to accept Microsoft's offer for the free upgrade on both my main work desktop and an old Vaio laptop which had been upgraded from Vista to Windows 8 then 8.1. Having upgraded to 10 on the "sacrificial" vaio, I really don't like it and have decided not to upgrade on my relatively new desktop which works wonderfully well as it is. From the GWX Control Panel I can see that I have a download folder on my desktop computer(size 6.1 GB) so it's apparent that it's there waiting to be installed. I've clicked the "Disable operating system upgrades in windows Update" in GWX.... is this enough to stop the program ever installing and can the download folder with Windows 10 files ever be deleted ? @B-Tech-Guy - Good tips for going the extra mile, thanks! @Claudia and Moondog D - Thanks so much! @John W. - You shouldn't have to download it more than once, since the GWX_control_panel.exe file should just be saved to your browser's default Downloads folder. I am considering doing an installer or at least adding the option to create a desktop shortcut to make locating the program easier. @DougCuk - I generally try to minimize the number of clicks people have to make, but I'm beginning to agree that a semi-detailed "Are you sure" dialog is in order. I will add that in the next update. In the short term, I've added some quick, highlighted notes in the documentation that will hopefully catch peoples' eye before they proceed. It really shouldn't be necessary for the majority of users; it's just been shown to help a few people with extra messy issues. @Don A. - Wow, how frustrating! I'm glad we were able to help you after your rollback, though. @Peter M - For the moment the settings GWX Control Panel puts in place are enough to protect you from unwanted upgrades. There's a recent post on Microsoft's "Windows Experience Blog" called "Making it Easier to Upgrade to Windows 10" which indicates that the push to get people to upgrade is going to accelerate in the coming months. We don't know exactly what that's going to look like, but for the moment we're good. @John W again - Thinking about it some more, could you have been using your browser's "run now" instead of "save" option when you were downloading GWX Control Panel? If you choose to launch a download directly from your browser, depending on your browser that actually can save the download as a temporary file which ultimately gets deleted after it's no longer needed. You definitely would have to re-download/re-launch in that case, but not if you choose to save the file, and then launch it from your downloads folder. Just realised that I can save the downloaded .exe file to my desktop - sorry to take up your time! Thanks again for your excellent work - I am so relieved not to have to deal with 10 issues until I am ready (if ever). Ultimate Outsider, wait so group policy+this program don't automatically hide these updates? I'll have to search for them and hide them manually at least once anyway? Windows 7 pro - I found I had the 6 gig of "gates virus" in the hidden folder. I used what I presume is V1.4 (just downloaded), yet I am still stuck with 2.1 gig of crap that requires permission fro SYSTEM. Persisting by deleting small groups, I was able to get rid of more. SafeOS.Mount requires permission from "trustedInstaller", and is still persisting. 1.5 gig remains at the moment. (yes, rebooted twice). Thanks for the app and advice that at least stopped the cursed upgrader. @Todd - For some reason your second comment didn't show up on this post, but I received an email notification about it and was able to see your feedback. I just added a new command line switch /norestart that will prevent the program from ever making a restart possible, which should help in situations where you've got a delay resulting in a click accidentally hitting the "Yes" button in a restart prompt. @Ontherunicorn - Thanks for the feedback! Yeah this feature is a real bear to test; there might be some timing tweaks I can make to kill those extra empty folders. (Sometimes the OS doesn't know a recently-emptied folder is empty right away, and it obviously won't let you delete a folder that it thinks still has contents.) Will keep an eye on that. I (and my clients) can't THANK YOU enough for pursuing this issue. Without GWX Control Panel and its constant updates fighting against the machine, we would all be totally screwed at this point. Anytime you want to put up a "Donate" button I'll be happy to click on it! Tech Note: I know this is a bit out of GWX Control Panel's mission, but do you or anyone know how to stop the uber-persistent KB2952664 from coming back and auto-installing time after time... even tho I've used every way known to uninstall and/or delete it -- and even tho I *never* registered for the Win 10 upgrade or installed it "accidentally" -- and even tho I have checked "Never Check for Updates" in my Win 7 Update Settings over a month ago? Regarding updates re-occurring, Microsoft seems to be doing something special with these specific updates (including KB3035583). They are re-issuing these updates but not changing the update numbers. (For example, I have seen at least two completely different sets of binaries installed by the "KB3035583" patch, depending on which wave was installed.) This has some strange effects: In one respect, Windows sees them as new updates (because they will automatically download and install on your computer even if you already installed them before), but in some way Windows sees them as the same. For example, I've had computers that received the first wave of KB3035583 and later received the KB3035583 refresh. If I then uninstalled KB3035585, doing so only rolled back the GWX binaries to their "first wave" version, rather than actually uninstalling them... however I then no longer had the option of removing the earlier KB3035585! The refresh made SOME version of the GWX app a permanent fixture on my OS! This is a long-winded way of saying I don't know how to protect against that stuff without just locking down your Windows Update settings (something I don't do, personally), but also my belief that we're seeing some new (intentional) behavior with these particular updates. My download of GWX Control Panel has been blocked by McAfee WebAdvisor with messages that say "That download is dangerous" and "We found that there might be viruses, spyware or other potentially unwanted programs in the file you are trying to download." Nope, Norton said it was a safe download for me. @Peter F - Just consolidating my comments on WebAdvisor since I have more information now. WebAdvisor doesn't actually scan any files for viruses or malware. Instead, before you download any files of certain types (EXE, ZIP, etc) from any given website it connects back to its database to check the site's "reputation score." If the site is both in their database AND has an established positive reputation, they don't display any warnings. But they will throw that same scary warning you saw if 1) site isn't in database, 2) site's in database but hasn't earned a reputation, or 3) site is in database and earned negative reputation. Last night I confirmed with the team who manages WebAdvisor's database that my site wasn't even in their database at all until yesterday, and now it is simply in "unverified" state because it's brand new and hasn't earned a reputation at all, one way or the other. I am extremely annoyed by how scary looking that warning is, given that it's based on a complete absence of data on their part. They should at least say something like "we are not familiar with this site; proceed with caution." But instead they lump any new/untested sites in with the bad guys. Anyway, thanks for the heads-up. It prompted me to get in contact with them and submit my site for review. Thank you for writing this tool. We do IT support for many companies, and upgrading to 10 would create havoc as they use specialized software. We have seen enough failed Windows 10 updates on regular home user machines to know. In the 20+ years we've been in IT, this is one of the worst cases of Microsoft stupidity we've ever seen. Donation will be sent. Keep up the great work! Forgot to mention above. I'm sure this has already been mentioned, but a 'check for updates' built into the program would be great. @Tina - Thank you! Regarding a 'check for updates' feature: I am wary of adding any actual Internet logic to the program because I don't want to give users any impression that the program is trying to "phone home" for any reason. That said, I am working on an improvement that should make it very easy for users to both check whether they have the latest version and download the new one if theirs is out-of-date. I don't have a timeline for that yet, but it will be soon. Hi UO. Thanks for excellent program. Had one minor hiccup with one of my W7 machines. "Delete Windows 10 Download Folders" only partially removed one of the folders. Tried to delete the folders manually as an administrator but was blocked for insufficient permission. Eventually resorted to Disk Cleanup > Clean up system files, which seems to have all the permissions required. @BillG - If you ever tried to delete any of those files manually, it's possible to put some of them in a state where my program can't "see" them. If this was your first time ever trying to delete them, I'm not sure what could have happened- but glad you were eventually able to remove them. Thx !! GWX Control Panel works exactly as advertised. However, I'm also experiencing another annoying "nag" from Microsoft ... Internet Explorer is continually launching itself with a www.microsoft page encouraging me to "Get the best Windows yet". Is there any way to stop this ? oops... my bad, I did have Adblocker running. Turned it off for your site and now I can see, and have already used, the DONATE button. As for KB2952664, this seems to be a special case. At least on my Win 7 system I was able to uninstall every single suspect update, including the sticky KB3035583, and not one of them has come back (probably because for the time being I have my Update Setting to "Never check for updates". Except in the case of KB2952664. I simply have not been able to uninstall/delete it at all. I've tried all the different approaches, including the DOS "uninstall" command. They all spin and then tell me I have "successfully uninstalled KB2952664" -- then request a restart. During the restart things go as expected with Win 7 telling me "Windows is configuring your update -- do not turn off your computer". In order words, the uninstall appears to have happened. But when the restart is finished -- even with my modem turned off -- I sign in, go directly to check "installed updates" -- and there it is: KB2952664, dated 10/28/2015 -- just sitting there, grinning at me! It still accesses an auto-run task scheduled to send data back to Microsoft every day at 3 am. Is the new update for Windows 7 users ("KB3035583") another patch to get the Windows 10 upgrade again? @gold1 - Thanks for the info! @Lucy - I don't know why they're doing it this way, but Microsoft keeps pushing new versions of the Get Windows 10 app without changing the name of the update. I don't know what the internal differences are, but each time they re-issue the update the binary files it installs are newer, with different version numbers... the name of the update is just the same. But as far as I know it's still just the app/icon that gives you upgrade notifications, not the actual upgrade installer. Oh I see! Then i guess i won't install that update then. I finally gotten rid of the icon in my taskbar. @Peter - Thank you! Just so you know, the next update I publish will have a feature I think you'll like a lot. Apologies for re-posting my previous question - but I think it may have been over-looked. I have used GWX Control Panel to successfully remove the Windows-update pop-up. Thx! ** However, I'm also experiencing another annoying "nag" from Microsoft ... If I leave my PC unattended, I can return to find many multiple instances of Internet Explorer opened at a www.microsoft page exhorting me to "Get the best Windows yet". Is this experienced by others (or just me)?! How can I stop it occurring? @JohnM - I'm sorry I didn't reply. I actually spent some time trying to figure out what you were actually seeing (and how it might be stopped) the other day, but I wasn't able to find any information. Can you possibly get a screenshot or something of the behavior you're seeing? I don't think it's something I've ever seen, but if I figure out what's happening, it might be something I can fix in a future update. You can message me directly at my facebook page (link in sidebar), or email me at reports@ultimateoutsider.com. Thx for your efforts on my behalf, UO. Strangely, the nagging lasted for about 1 week - from a couple of days BEFORE I had applied GWX Control Panel (to successfully remove Win10 pop-up) until a just a few days ago. Unfortunately, I didn't think to take a screen-shot. If it starts-up again, I'll take one and send it to you. Thx again for your assistance. Is it possible to download this application separately, say on a Linux OS, and put it on a usb then transfer it to a Windows 8.1 and run it without allowing the Windows to have network connection? I am quite apprehensive to start-up my Win8.1 with automatic connection to network to see the upgrade in progress, since i had already reserved the upgrade initially before discovering my dislike of the MS approach. We just tried it and it works as expected. Downloaded it to our Ubuntu server, put it on a usb stick, copy pasted it to desktop (probably not required) and ran it. And even if it didn't, if somehow Windows 10 installed itself, you have 30 days to roll it back. I ran this program 2 days ago and ever since, Microsoft Outlook crashes about every 3-5 minutes while I'm actively using it. It seems to happen on certain emails, for example, one that requires downloading pictures. Not every such email causes it, but it's usually the 4th or 5th email I select. Can you help with this? @Claudia - That sounds like a frustrating problem, but it's unlikely what you're seeing has anything to do with my program. Microsoft actually pushed an update to OneDrive this week which has caused all kinds of weird behavior in different applications. That would actually be my first guess if you have OneDrive installed. If you suspect my program is the culprit, all you need to do is run it again and re-enable things that you had previously disabled; doing so will undo any changes my program made to your system and put you back where you were before you ran it. I would like to know whether the problem goes away after doing that. Microsoft just released another update tonight that addresses, among other things, the problem I was having. I applied the update and it seems to have fixed it. Just a coincidence. Thanks for your quick reply. I have been using the heck out of the /norestart switch. Makes for a peaceful coexistence with Go To Assist. Thank you! Dear Ultimate Outsider, I feel compelled to tell you this, as it has given me new hope about keeping my current Win10 installation!! I bought a new laptop which came with Win10 pre-installed. There was a LOT I did not know about the "NEW" OS that had I known, I might have opted for a DIFFERENT system altogether or possibly built my own! I am an IT pro, and can build custom laptops if needed, it just so happens that I like HP though for my own purposes! I EVEN thought I was against HP after finding out so much more about Win10 and the current Hardware Locks and DOWNGRADE DIFFICULTIES that might be encountered if I were to want to put another OS, preferably Win7 or Win8, which I have finally come to love after learning how to custom configure it to my preferences and administer it properly. That took me almost two years however to do, even as an IT pro!! And just when I had done that, here comes Wun10 rearing it's UGLY HEAD!! YES, I DID HATE IT after learning MANY insider secrets about the "NEW" OS, and it's nearly total removal of USER CONTROL and SPYING abilities, not to mention the HORRIBLE UPDATE and UPGRADE POLICIES built in!! Well, furious as I was, I was just about ready to go all in and forget about UEFI and do a LEGACY install of Win8 on my new laptop, when I mysteriously discovered your GWX Control Panel, and here is where this get's good!! I really didn't want to go through all of the hassle of re-installing my 90+ Programs ALL OVER AGAIN!! This came as a result of the AUTOMATIC UPGRADE to the NOVEMBER UPDATE, which DELETED MOST OF MY 90+ Programs and REINSTALLED ALL OF THE WIN10 "APPX" that I had so painstakingly REMOVED out of HATRED!! "THEY ALL SUCKED"!! Here is the PRICELESS GEM!! 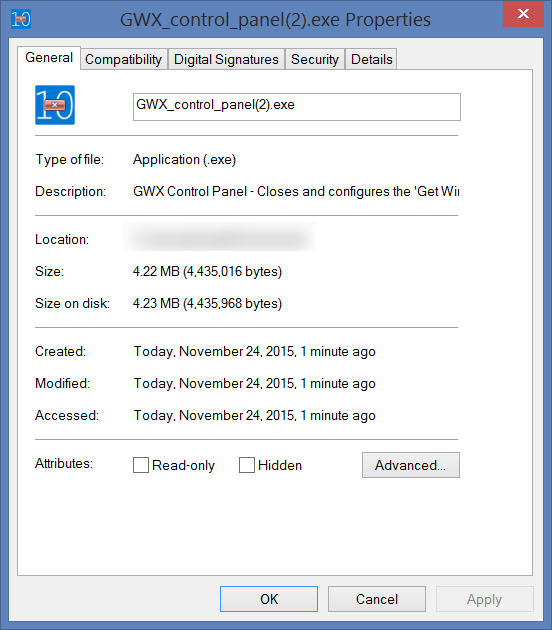 YOUR GWX CONTROL PANEL APPEARS TO ALSO WORK WITH WIN10!! I used it to STOP the AUTOMATIC UPGRADES and UPDATES from taking place any longer, leaving me with a VERY FAST and STABLE OS NOW!! I use Acronis True Image 2016, so I of course put everything back to how it was before the NOVEMBER UPDATE HELL and JUST PRIOR TO WIPING MY HD discovered your Program and attempted to use it for my own purposes, AND IT WORKED!! It has been two whole days now and Microsoft has not been able to install any more automatic updates or upgrades to my system, including of course the NOVEMBER UPDATE, which is MANDATORY, just as all future updates would be, etc... YOUR PROGRAM MADE IT STOP!! It gave me ULTIMATE USER CONTROL OVER UPDATES and UPGRADES in Win10, which for now, is EXACTLY what I needed after all my hard work installing and customizing my configuration and programs!! So for now, it is PERFECT since I also COMPLETELY REMOVED ALL "APPX" installed by Microsoft and it is VERY FAST and STABLE!! Thank you so very much for your wonderful program!! Perhaps you can update it's description and function to include this information for Win10 users who like the OS but NOT it's TOTAL CONTROL over their lives!! Thank you once again!! Thank you for your great efforts and good program. I uninstalled 3 MS updates - KB3035583, KB2952664, KB3021917 - all I think related to GWX. Then I loaded and ran your program. It says: 'Get Win 10' not running, not enabled; Win 10 download folders not found. At the same time search on C:\Windows\ for "GWX" brings 19 items, in folders winsxs, amd64_microsoft..., Manifests. I cannot get permissions to remove them. Should not your program do that? @ "." - Thank you! Very interesting to hear that you found some use for the program on Windows 10! @Dr. Serge - At this time my program does not actually delete or uninstall Microsoft's GWX app. I only disable the program so that it doesn't bother you anymore. I did this because I wanted to give people the ability to turn the notifications back on if they want to eventually upgrade to Windows 10. A couple of folks have requested the ability to delete the GWX application... so it's something I'm considering, but not on my immediate roadmap. Just a couple minutes of understanding the control panel it did the job in about 3 seconds. All I can say is that this is a great and simple tool. Windows 10 is planning on forceably installing it on all computers as of Jan. 2016..I've followed the instructions on here but the Windows 10 icon is still on my taskbar....can they still forcably install Windows 10 in 2016 with that Windows 10 icon still on my taskbar even though it's not running? @777starwoman - Are you saying that you clicked the "Disable Get Windows 10 App" button but the icon still remains in your notification area? Could you possibly show me a screenshot that shows what GWX Control Panel currently says when the Win 10 icon is visible? (I'd like to see the icon as well.) You can upload the screenshot to a free image host like imgur.com and link it here, or email it to me as an attachment to reports@ultimateoutsider.com. I've only had two previous reports of people who weren't able to get rid of the icon, and one person eventually saw it go away. But I've never had access to one of these computers, so I don't know what's going on here. It is very mysterious, since I've never seen the icon detect/disable features not work. Also, we don't know what's going to happen in 2016. Microsoft says they will give users the ability to block the upgrade, but I'll believe it when I see it. You are a true hero. At first, I was a bit suspicious towards this program and whether it'd do more harm than good (not necessarily a bad thing these days) and meanwhile began to sink towards desperation with the constant "Get Windows 10"-crap manifesting and re-manifesting itself in Windows 7, no matter what GWX removal instructions I tried to follow the best I could. No words can explain the relief I felt as GWX Control Panel instantly got rid of all that Win10 junk on both my desktop and laptop PC's (they're running on Win7/64-bit, Ultimate/Home editions). I'll donate what I can - a few beer pints worth at least, I hope. Thank you!!! Never give up this good work. Bless you. @Bing - Really glad to hear I could help! In the long comment above the writer mentioned "the AUTOMATIC UPGRADE to the NOVEMBER UPDATE, which DELETED MOST OF MY 90+ Programs"... I applied an update to my Win 7 PC just a few days ago (after using the GWX control panel), and it appears to have deleted my antivirus program (AVG). The next time I started my PC, I had a message that I was not running an antivirus program, and sure enough, it was nowhere to be found. I still had the download so I reinstalled it right away. I find that very odd, and it makes me wonder if anything else got deleted. Has anyone else experienced this with Win 7? @Joyce - Very glad to help! Thank you! I was doing a windows update two days ago using a slow public wifi and amongs many "failed" updates, when I disconnected the wifi I saw a note saying I had a file more than 2 Gb partly downloaded. I guessed this was a win 10 issue and found your webpage after gooling and have used your tool and instructions to prevent the win 10 intsallation and to delete the related updates and files. However, since then I have not been able to get windows update to work, Every time I try it it tells me I need to restart. The following is displayed. Windows update cannot currently check for updates, because you must first restart the computer so that a previous installation can be completed. Windows can't update important files and services while the system is using them. Save any open files and restart the computer, and then try to check for new updates. The pc seems to work fine provided I set updates to "Never" but can you suggest how I can get the updates (other than for win 10) to work again? @PaulD - My guess is that Windows Update didn't fully clean up after itself when you encountered those failed installs. My own program checks for pending updates and warns you to restart before proceeding. If you didn't see that warning, or if you saw it and restarted, then the symptom you're experiencing is likely a "false positive." Microsoft has actually published a number of Fixit tools for Windows Update (I know of at least three). If you haven't tried it already, I'd start with the one called Automatically Reset Windows Update Components as I think it is the most comprehensive. If that doesn't work for you, I have heard that many folks have had success with the Windows Repair Free utility. (I haven't tried this one personally.) I might add something to the diagnostics feature of GWX Control Panel to capture more about the Windows Update settings, but at the moment it only looks at info specifically related to OS upgrades. @Todd - Oh, haha, the installer is actually smaller than the stand-alone executable. The installer is indeed 2.3MB, but the installed program expands to full size. You can still download directly as the 4.2MB EXE from the downloads page though. I appreciate that you've developed and provided your tool, "GWX Control Panel". I've applied it and I presume it has worked to rid me of Microsoft's "Nagware Windows 10 upgrade reminder", as there appears to be no trace of Windows 10 on my HP G71 Laptop (Windows 7 Professional): the icon is removed from the status bar, etc. The Network Icon in the lower right corner of the screen, in the pop up status bar, has a red "X" across it, indicating no network connection. Immediately before I applied "GWX Control Panel" I was connected to the internet via wifi (see below) and there was no red "X" there. In fact, I used that internet connection to both write you and download "GWX Control Panel". As I write this, I have the laptop's internal 10/100 NIC disabled (since it's not connected to anything) and the Wireless NIC enabled and connected to public WiFi at McDonald's (thank God for McDonald's WiFi, lol). As noted above, I used that WiFi connection to download "GWX Control Panel" (complete executable). This is a minor irritation and just slightly disconcerting because I actually DO HAVE internet connectivity and everything appears to be working fine, except for the annoying uncertainty of whether or not I'm actually connected because of the red "X" (maybe that's Microsoft's "back atcha" for applying "GWX Control Panel", lol: they put a large red "X" over the network icon instead of displaying the Windows 10 upgrade icon, lol). @Doug - I'm 99% certain the red X is unrelated to GWX Control Panel, but for troubleshooting, the first thing I'd do would be simply restart Windows and see if the X goes away. If the symptom persists, I'd try some of the solutions suggested here. If you remain convinced GWX Control Panel was the culprit, you can reverse any changes it made by re-enabling anything you had previously disabled in the program. I've read that sometimes proxies, public hotspots, and even some device drivers can result in the red X symptom too... lots of things to look into if the issue persists. I'll try the things you've suggested at the "suggested here" link in your 11/24/15 1:46pm blog entry (As I write this I haven't yet done that). However, the FIRST thing I tried was rebooting the PC and Windows. I wasn't messaging you in order to blame "GWX Control Panel". I perfectly understand there can be unintended consequences from any action I take. Your tool is pretty handy and I commend you for developing it! I just wanted to give you some feedback. You've indicated that you've heard about this before, and that's reassuring. It seems to me that the red "X" over the network icon is an unintended consequence of applying "GWX Control Panel" and removing the Windows 10 Nagware" - somehow, the "Windows 10 Nagware" and the network icon are interconnected or there's a dependency. But, I agree that this isn't anything you caused. I wasn't writing to accuse you. I was writing simply to inform you about this if you didn't already know about it. It seems you already do know about this. Just for the record, though, I've connected at this particular McDonald's WiFi multiple times without ever experiencing a red "X" over the network connection icon. I'll let you know how I fare by trying the the things you've suggested. @Doug- Just so we're clear, I'm only familiar with the "red X" because I have a long history in developing networking software for Windows, not because anyone has ever reported it as a side-effect of running GWX Control Panel. The main reason I doubt the program played a part in the icon appearing on your computer is that the program doesn't use or touch any networking components. I was just suggesting some things that I'd personally do if I were experiencing the same issue. But like I said; you can reverse my program's settings by just using its "enable" features... if the program really was responsible, re-enabling those things should put things back to normal (and I would like to know if it makes a difference). No offense taken or intended, by the way! Following the "suggested here" link you'd earlier provided, I was able to restore the network icon so that there's no red "X" erroneously indicating that I'm NOT connected when, in fact, I am connected. Just wanted to say "Great job on the GWX Control Panel" and thanks. Luckily for me, the only thing I needed to do was "Prevent OS upgrades". Everything else was "not found". The only thing I noticed was, during the restart, I heard a Windows sound I had never heard before. Checking the sound files, the sound was for "Device failed to connect". But my mouse and keyboard worked fine. I also have a USB hub with some external hard drives attached (which are attached to a power strip and usually only turned on as needed), and they all worked fine. No problems shown in Device Manager and nothing out of the ordinary in Windows Event Logs. So for now, I'm considering it a non-issue, but just figured I'd relate it in case anyone else encounters a similar issue. Thanks again. What is going on? Every time I turn my computer on after being off overnight, the "Windows Update OS Upgrade" is being reset to "Yes". I have v1.5. @JohnPD - GWX Control Panel looks at a bunch of settings, and in the past two days I have noticed changes in two of them, both in the "OSUpgrades" section of the Windows Update settings. I have seen these settings change on my test computers and have also heard a couple reports from users. You are not getting false positives; these settings are really changing- but I don't know which Windows components are changing them yet. I recommend checking out version 1.6.0.1 (the current one up for download), as it covers a few more settings. I'm also thinking about putting some more detailed information in the logs so that users can see exactly what Microsoft is doing under the hood. I'm going to be updating the documentation to reflect all the new features in 1.6 shortly; have just been fielding some questions and doing some investigation into this suspicious activity I've seen in the past couple days. Something weird is really going on. After disabling the "OS Upgrade" and rebooting, it was ok. I checked about 10 minutes later, it was reset again. The only thing I set was the "Disable Operating System Upgrades in Windows Update". I have virtually nothing in the "$Windows~BT" and "~WS" folders (415KB). I had downloaded the Media Creation Tool to update another computer which may have put something there. I still have the "Get Windows 10" app running as I don't care that it runs as long as it can't do anything to my system. I have a Windows 8.1 system. OK I installed v1.6 and it appears to be holding. I will continue to check. I would not put it past MS to try to defeat your program. @JohnPD - If you see the settings come back again, use the new "Save Diagnostic Info" feature and get it to me. I can decipher it and tell you exactly what changed. It definitely feels like MS is stepping up their efforts to push Win 10 again, but too early to say for sure. I am still good. I will let you know if anything changes. I see that the "Save Diagnostics Info" is part of the "Monitor Mode". I will give it a try. Thanks again. This utility is worth more than I can give. I was good when I first turned on my computer after midnight but somewhere along the line my OS Upgrades was changed to "Yes" again. I sent the info to you. According to your request, I have disabled the icon as well as the OS upgrades to see if that cures my problem. There is one issue with your program I forgot to mention. When I reboot the computer and I had the Monitor Mode enabled at the previous shutdown, the monitor icon does not appear in the System Tray although the app indicates that it is enabled so I have to disable and re-enable it to get the icon. It looks like disabling the GWX icon has solved the problem. No changes since I did that. Thanks Josh for a great program. I just downloaded the Installer program for GWX and installed it on my computer. tray. There was no desktop icon and the program is not listed in the Start Menu. why isn't it available to run anymore? BTW, I uninstalled the first version and then reinstalled it again from the Installer that I had downloaded to my desktop, and the program started and ran as before. However, when I rebooted again, the program was once more gone.